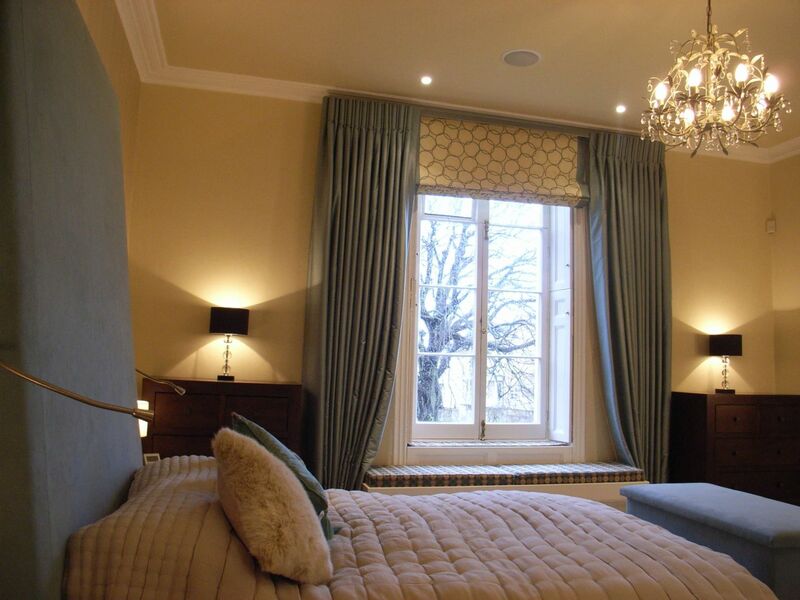 This bedroom design in Clifton, Bristol was set in a fantastic Victorian property. The clients felt that their bedroom had not had the same attention as the rest of their home. It had an eclectic mix of furniture gathered over the years. Heavy curtains blocked out the daylight and the central ceiling fan looked out of place. The interior design brief was to transform this into a stylish retreat, increasing natural light and introducing new furniture. An oversize headboard makes a real statement in a bedroom design. With these particularly high ceilings, we took the opportunity to design a large headboard to give the bed greater prominence. Upholstered in padded blue fabric, we incorporated a comfortable shape for the occcupants to lean against. We also fitted touch-sensitive fibre optic reading lights allowing one partner to read whilst the other could sleep undisturbed. 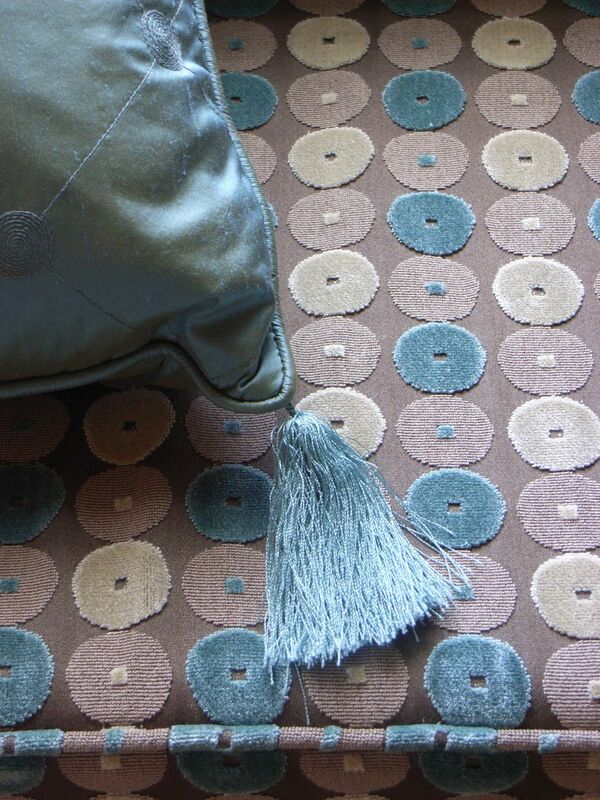 We designed and made this Ottoman, upholstered in the same fabric as the headboard. The mechanism is operated by remote control which automatically turns on the TV when lifted, and turns it off on descent. We controlled our bedroom lighting by a number of switches. Main lighting was a series of recessed downlighters on a dimmer switch which we complemented with a stylish central chandelier. 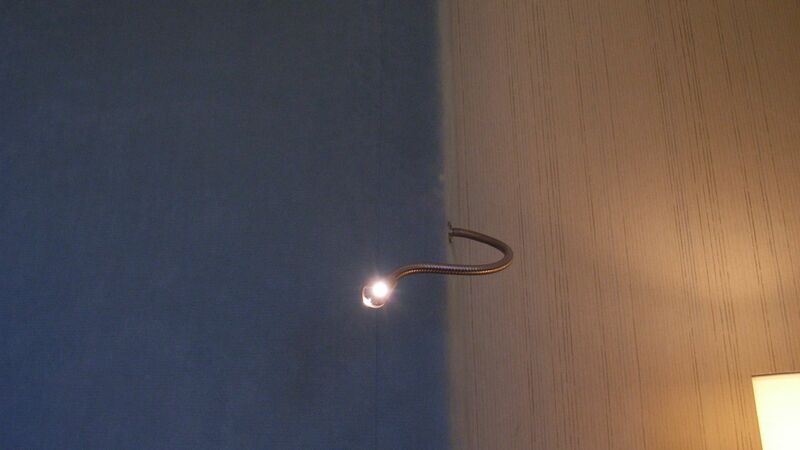 Installing additional bedside lamps for general use, fibre optic fittings provided local light for reading. 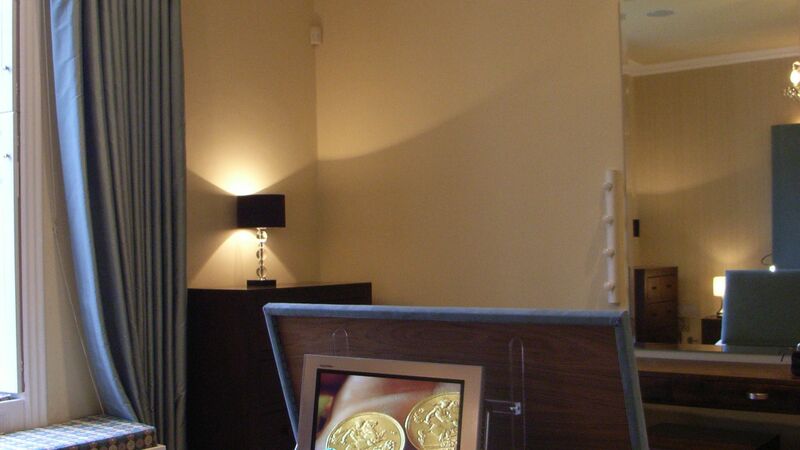 We fitted make-up lighting either side of a large mirror over the dressing table to add a touch of film-star glamour. Apparently our clients’ daughters spent a lot of time here. Apologies for the small image; it’s all we have. 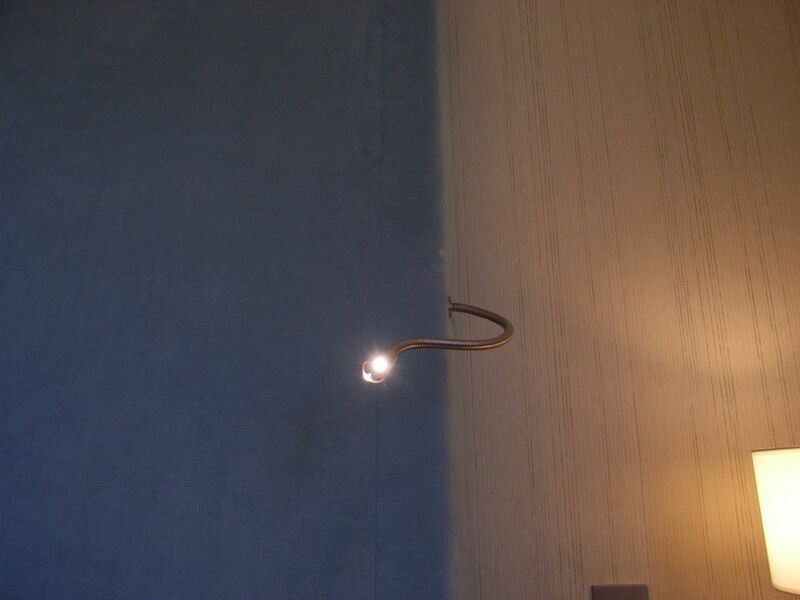 A 5-Amp lighting circuit then controlled all the table and side lamps from the door switch creating a series of welcoming glows around the room. 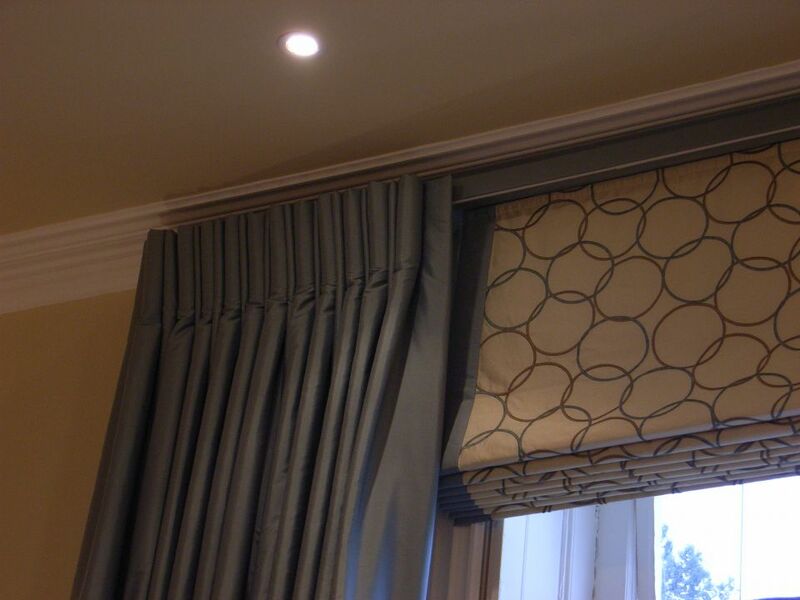 The combination of roman blind with dress curtains allows natural light to flood in, with the two huge frameless bevelled mirrors bouncing this light around the room. 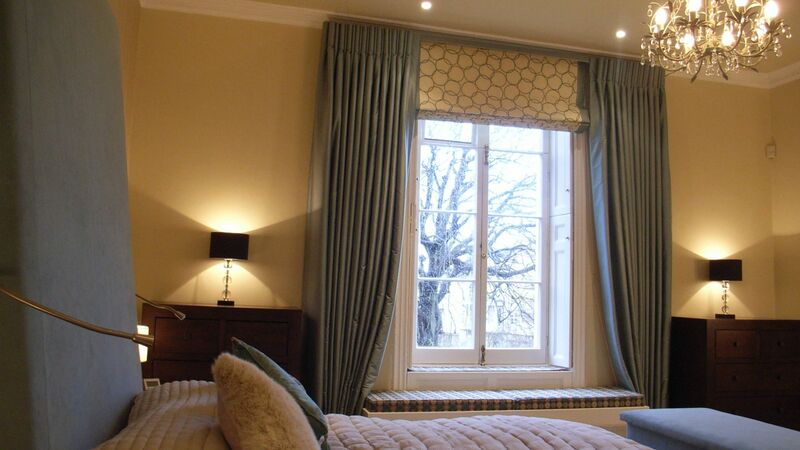 The silk blind was a series of pale blue rings on an ivory coloured background flanked by silk dress curtains. 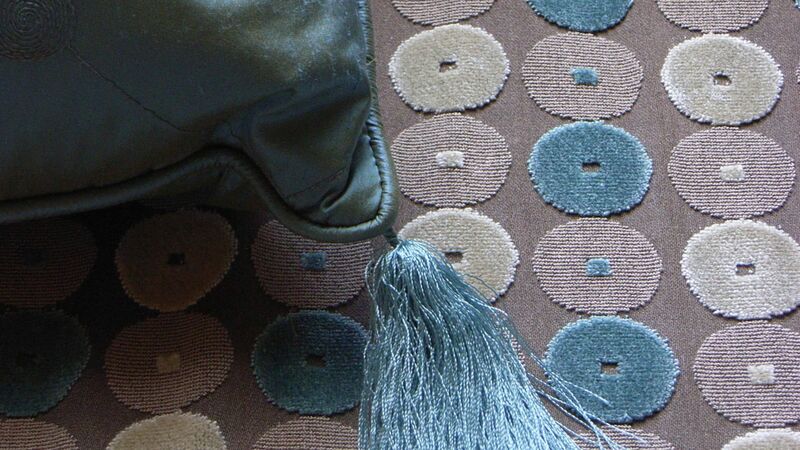 Matching the faux suede on the headboard with that on the ottoman, we chose neutrals for the bedspread and walls. We also upholstered the window seat cushions in a spotty chenille that we absolutely adore. 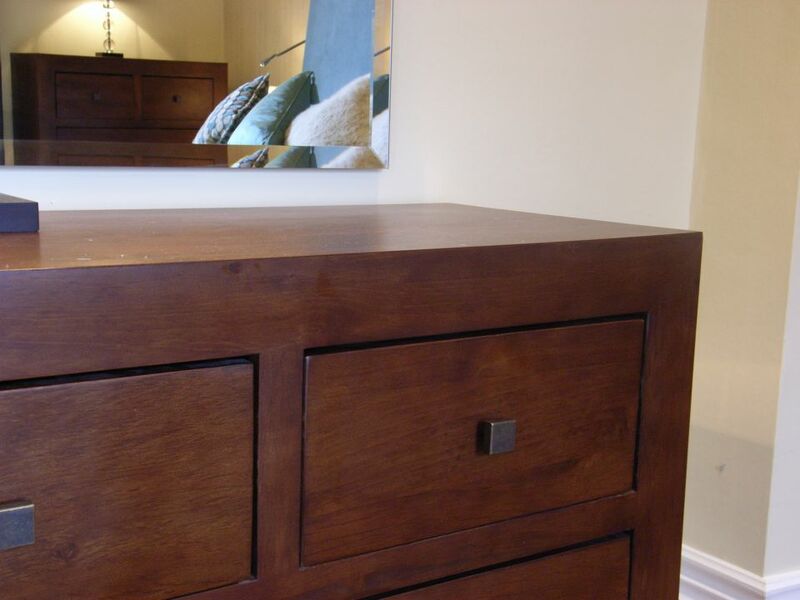 We chose dark wood furniture in contemporary style, including bedside cabinets, and 2 sizes of chest of drawers for storage complementing the clients’ walk-in dressing room. 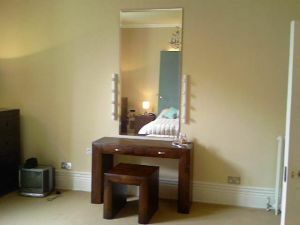 The dressing table was a simple dark-wood design, using a solid side table as the seat. Cushions are always a great way to dress a bedroom design. 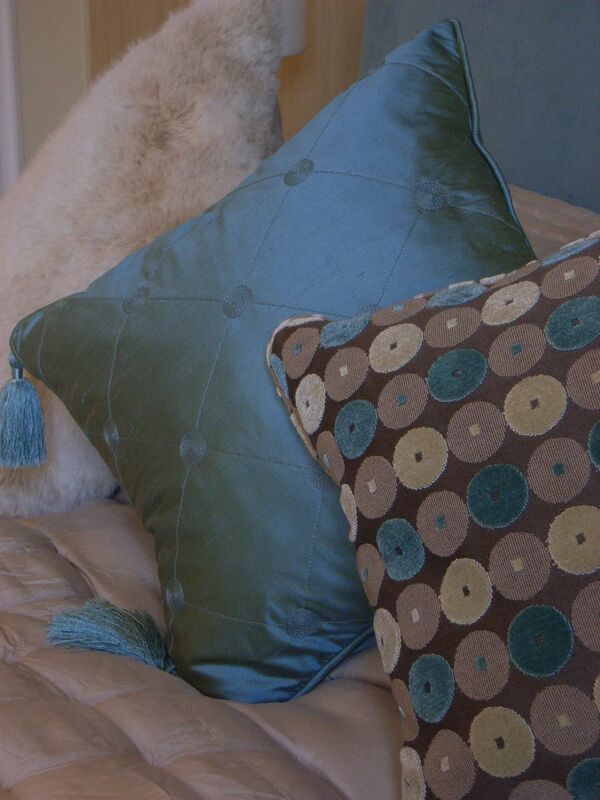 Here we had several cushions made in fabrics and textures to tone with the rest of the space. We revisited this client 7 years after we had finished the project and the bedroom still looks as fresh as when we did the work. 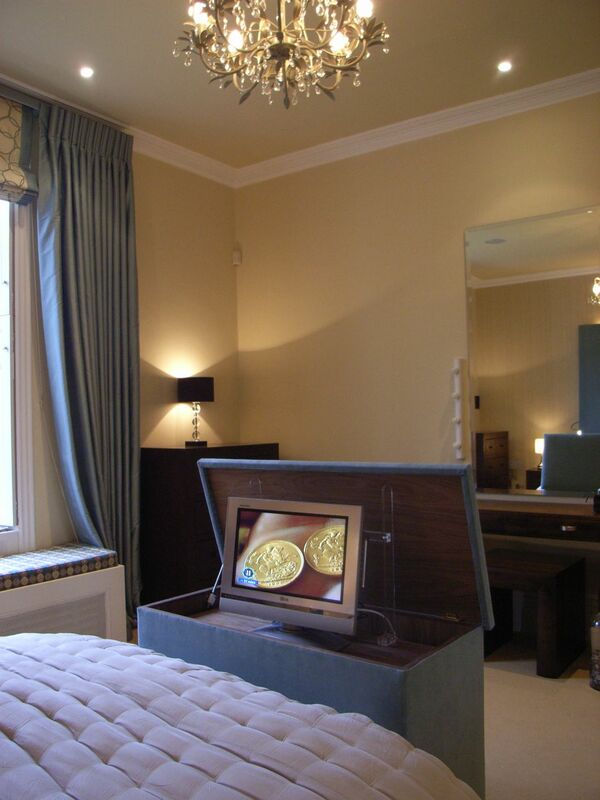 If you’d like ideas for your own bedroom design in Clifton, you may care to look at our hotel inspired bedroom design. We aim to renovate bedrooms with exquisite style, using luscious fabrics, beautiful furniture and sumptuous flooring. Please call if you think you might like us to help.